After a terrible start to the season, Sharks FC has improved tremendously. The traditional club from Port Harcourt is currently mid-table with 47 points in 34 matches. 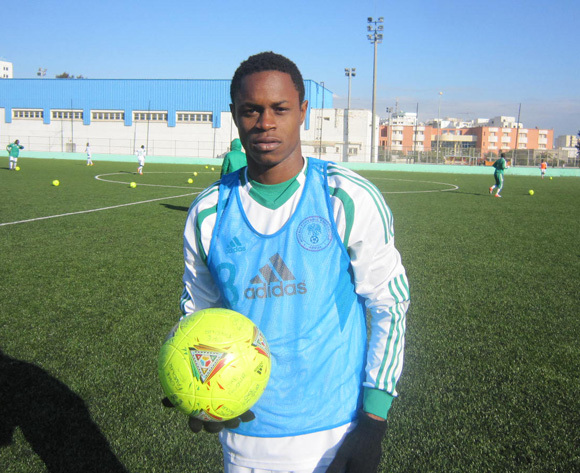 It is quite easy to point at the hottest prospect at the club: Christian Pyagbara. The 17-year old youngster, also known as “Dumte Pyagbara”, played about five minutes of football for the Nigeria U-20 national football team during the 2013 FIFA U-20 World Cup in Turkey. At Sharks FC, Pyagbara is a key player and the current top scorer with five goals in 13 matches. Pyagbara is a versatile attacker, confortable at right-wing, as a support striker or in an attacking midfield role. His strenghts include dribbling skills, creativity and pace. The picture, found on MTN Football, shows Pyagbara at training with the Nigeria U-20 national football team. Veteran Danladi Isa, the first choice goalkeeper at the club, is facing tough competition from Ikechukwu Ezenwa and the “legendary” Chijioke Ejiogu. The youngster Moses Awala has played approximately 25 matches in his first ever season at top level of Nigerian football, primarily as a centre-back. Awala has been partnered by several different players. Lately, Gabriel Olalekan, formerly of Shooting Stars FC, has been preferred with success. Team captain Odinga Odinga and Yinka Adedeji are two quality full-backs. Jonah Abutu has played approximately 21 matches as a midfield enforcer. Nasiru Hussaini, an attacking midfielder signed from Kaduna United FC, has done well since joining the team in May 2013. Ezioha Okereke is an attacking midfielder / winger with an amazing range of ball skills. Midfielders Fortune Omoniwari and Thompson Stowe are currently in the best form of their careers. Arguably, Tayo Fabiyi is the most influental striker in the squad. The tall centre-forward, formerly of Kwara United FC and Rangers International FC, has scored four goals in 22 matches, not that impressive, but he is creating a lot of space and a lot of chances for his teammates. A lot of the other strikers at the club has been rather quiet, including big-name players such as Gabriel Agu (formerly of Enyimba FC), Christian Ifeanyi Inyam (formerly of ASEC Mimosas, Ivory Coast) and Isaac Loyte (a full international player for Benin).